Stonyfield Farm, an organic corporation started by Samuel Kaymen in 1983, really rocketed to prominence when its then president, Gary Hirshberg, discovered a way to increase his market share with not much marketing cost at all: where most companies marketed by saying all the benefits and improvements they have, Hirshberg began marketing what it did not have. And that missing thing was science. Lots of sugar? His yogurt has that. Nonetheless, Hirshberg began marketing his yogurt as baby food. Powdered milk imported on giant emissions-belching ships from foreign countries? It has that. Nonetheless, Hirshberg began marketing it as "organic" and therefore better for the environment even though there is no spot testing in the foreign countries he chose, not to mention those giant emissions-belching ships. Nor would anyone be able to tell the difference if there was spot testing. There is absolutely no way to detect in milk if a cow ate organic feed or feed that came from a GMO, that is why Europe bans most GMOs...except in animal feed. Gary so established himself as a marketing genius wrapped in a health food halo despite the sugar and powdered milk that none of his fervent customers seem to know Stonyfield is actually part of a multinational conglomerate, Lactalis, which has far more revenue than the Big Food Agrichemical company he is perpetually demonizing, Monsanto, and is constantly under criticism for exploitation in developing nations. Stonyfield is part of the largest dairy conglomerate in the world. They are the biggest of Big Food. And they act like it, even engaging in the tone-deaf sexism that committees might have once thought was smart but a small company in touch with its customers would not. A recent commercial sought to appeal to those same concerned moms that this patronizing white man has mobilized in the past. In a #MeToo world, even those on his side of the political aisle have been calling Stonyfield out for sexism. What values do Stonyfield cater to with their new commercial using girls to terrify girls about science? If we accept that peers make a difference and that therefore young girls need Scientist Barbie and female doctor role models, the message Gary Hirshberg is sending when his company chose to have a video undermining the safety of our food supply is that girls need a multinational conglomerate like Stonyfield, chaired by a middle-aged white man, to protect them. The message is that girls can't understand science. The message is that Stonyfield wants to train the next generation of females they believe are clueless about science, and they want to get to them at a young age. In the 1950s and '60s, that was the tactic of Big Tobacco. If they were going to create smokers they had to get them hooked young. 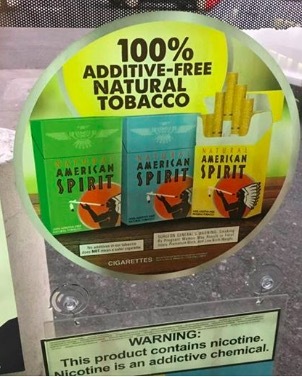 Today, Big Organic marketing is so corrupt that Big Tobacco is mimicking them. After their latest campaign, the public is fighting back. When they were first criticized, Stonyfield declared the army of commenters "trolls" presumably built by Monsanto - you know, the company with billions of dollars less in revenue than either Lactalis or Whole Foods - and systematically deleted everything critical of their marketing effort. Stephen Niedenback of the Facebook page We Love GMOs and Vaccines noted the irony of a Jewish man creating lists of his enemies and posting them for his followers. Because they aren't enemies, many of the people criticizing them probably like yogurt, even if they don't buy into his mystical beliefs about food. Instead of being trolls it was overwhelmingly farmers, scientists, parents not educated by advertising, and science journalists. In their response after the blowback, their supporting documentation for why they promoted scary stories about GMOs while knowing they are not harmful came from their own marketing literature and the trial lawyers at Environmental Working Group. And for good measure, the IARC Working Group, even though they know the guy behind it signed an agreement with trial lawyers to sue Monsanto in California before the paper on the hazard rating they chose for the herbicide compound glyphosate was even released. Five years ago, bans on comments and lies about scientists and media would have worked. Not today. Stonyfield may have just lost its battle at Gettysburg and the people that are slaves to its anti-science spin will soon be freed. (1) Whereas the pro-science community has failed in that regard. How many time have we seen articles and ads about agricultural science that have pictures of tractors and graphics about higher yields? When only 2 percent of the country is in agriculture, they don't care that a company gives a farmer better profit margins. (2) Burberry ties are still just ties, if you are going to wear one most people will not notice if you paid $30 or $100, but they can charge $100 or more because they are selling the value of superior fashion. It does not matter how much money I acquire, I will never buy a Bugatti Veyron. It is still just a car to me. Bugatti knows their market, so they do not send me literature on buying one just like Dr. Bronner Magic Soap does not try to sell me their fashionable nonsense. Hank Campbell is the President of the American Council on Science and Health and founder of Science 2.0. Neither Big Conventional Yogurt nor any trade group paid him to write this article, directly or indirectly.